2012 Knapp Award: The Rev. Dr. Horace T. Allen, Jr.
A few weeks ago, with the help of the Holy Spirit and a bit of advanced planning, I had finished writing my sermon fairly early on Saturday night. That week, Jesus was flipping tables in the temple and, with significantly less drama, I was guest preaching the next morning at a nearby Lutheran church. I scanned the screen for any last typos and toggled over to Facebook. There were everyday posts about dinner, the glorious but frighteningly warm weather in New England, and the second chapter of John. I watched two clergy friends post back and forth discussing the conclusions for their respective sermons. They were from two different denominations, serving churches thousands of miles apart. Their exchange was theologically deep and public. And they were talking about the Revised Common Lectionary readings for the week. And that strange foretaste of Christian unity would never have happened without the life and ministry of the Rev. Dr. Horace Allen. It is with great joy that I stand to tell you about Horace. When Rev. Dr. Tom McKibben and the Nominating Committee recommended Horace to the Board, there was unanimous affirmation. 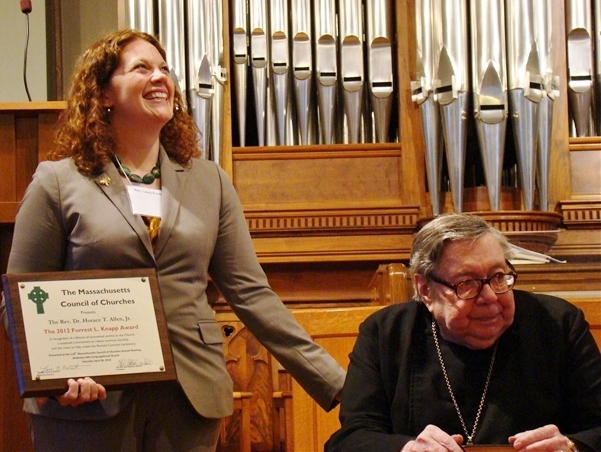 The Forrest L. Knapp Award, named after the Massachusetts Council of Churches Executive Director 1953-1969, was created in 1977 to honor those who have “contributed significantly to the advancement of ecumenism in Massachusetts.” The criteria for the Knapp award says ‘ a strong preference will be given to expressions of sustained commitment.’ Indeed, all of this is true of Horace. Raised outside of Philadelphia, with his father as an elder at the Sharon Hill Presbyterian Church, the first plane flight Horace ever took was to the 2nd World Council of Churches Assembly in 1954 in Evanston, Illinois. As a youth steward, Horace gathered the autographs of the church leaders in his Who’s Who book and after the assembly snuck off with the blue and white placard for the Ecumenical Patriarch of Constantinople. From that point on Horace said, “whatever my ministry, it is unthinkable that it will not be ecumenical.” Horace described himself as a “devout but suspicious Presbyterian” with “a long history of fighting with the Presbyterian Church.” The first in his class graduate of Princeton University, Horace began his seminary training at Princeton but graduated from Harvard Divinity in 1957. In 1966, Horace became the first Ministerial Warden of the Iona Abbey in Scotland, making him the ‘successor-in-place to St. Columba’ and ‘the Keeper of the Graves to the last Kings Macbeth and Duncan.’ In Iona, Horace soaked up the liturgical possibilities for his church. Horace returned to the US for doctoral studies at Union Seminary, writing his dissertation on the new Presbyterian Book of Common Worship. In 1970, Horace was appointed the first director of the Joint Office of Worship and Music for the General Assemblies of the United Presbyterian Church (Northern) and the Presbyterian Church in the U.S. (Southern). When discussing whether this new post should be housed in Philadelphia or Richmond, Horace proposed that his office be housed in a railcar, allowing him to criss-cross the country introducing Presbyterians to their new WorshipBook.Before there were social networks, there was Horace. But what Horace deftly snuck into that WorshipBook were the few pages in the back that proposed a systematic way of reading the Bible in worship through the year. The timing was perfect for ecumenical innovation. In 1969, the Vatican released the English texts for the new Roman Lectionary. Horace and others saw an opening, an “ecumenical wedge” as he called it, to graft the free churches onto this growing liturgical consensus. Now because of the work of Horace and other dedicated liturgists, Christians across the world hear the same Scripture texts on the same Sundays. Through the common lectionary of the Consultation on Church Union, they realized they had a chance to introduce a new wrinkle in the Protestant worship. From 1975 through 1997, Horace Represented the Presbyterian Churches on the North American Consultation on Common Texts and co-chaired the English Language Liturgical Consultation. The common lectionary is a relatively new innovation, with the trial period beginning in 1983 and the Revised Common Lectionary published in 1992. As Horace quipped, for Protestant worship a common liturgy gave the Congregation “not the wisdom of the pastor on Friday night, but the wisdom of the Church.” Horace and his ecumenical counterparts introduced this innovation at the right moment as biblical scholarship, new hymnals, an ecumenical spirit of cooperation and an emerging liturgical renewal were moving across the Church. Now twenty years on, this ecumenical innovation in our common life has sparked countless ecumenical study groups in town clergy associations and online innovations like the Text this Week blogs, WorkingPreacher.org, and The Revised Common Lectionary Facebook group . Only 20 years out, we have not fully gleaned all of the ecumenical fruits of this innovation. In 1978, Horace was called by Boston University to be the first Professor of Worship, a position he held until retirement in 2003 with the title Professor Emeritus. He taught 200 classes in preaching, church music, architecture and liturgy. He was the first Christian Cleric to teach at a Chinese University since the Maoist Revolution. A 32-yr member of the Boston Minister’s Club (and with many of those friends present), Horace is a prolific writer with such publications as “Where (again) the Medium is the Message,” “Catching up to Calvin,” “Is there an emerging Ecumenical Consensus Concerning the Liturgy,” and “Bach is a Four Letter Word.” There is much, much more to say about Horace’s generous teaching, writing and ministry. When I sat down with him to talk about this award, he said I feel vindicated. The Rev. Dr. Horace T. Allen, Jr. In recognition of a lifetime of ecumenical service to the Church, a sustained commitment to robust common worship, and the vision to help create the Revised Common Lectionary. Congratulations, Horace! I was blessed to study at the feet of the Master for several years. Horace, I am writing to tell you that I have made copies of your 1984 five page “Lord’s Day – Lord’s Supper” paper that is just as relevant today as it was back then. We are getting ready to publish the next edition of the; Book of Common Worship to come out in 2018. Isn’t it sad that your paper is just as relevant today as it was in 1984! I hope we are more effective this time.